Excuse Me. You’re In My House, Eating My Food … ! A burglar apparently got a case of the munchies after breaking into a house in the 700 block of North Seventh Street on Tuesday afternoon, and — possibly even more bizarre — he argued with the occupant and refused to leave once she returned home. Capt. Mike Sweeney said Luella Garrett, 52, returned to her home about 3:10 p.m. to find a stranger sitting on her couch. She called 911 to report the incident, telling the dispatcher that the man refused to leave, Sweeney said. Sweeney said officers responding to the call found empty boxes of Cap’n Crunch cereal and Crunch ‘n Munch popcorn in the kitchen trash can. 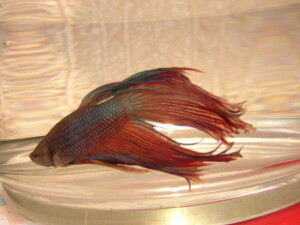 Also, a Brillo pad was missing, and two betta fish were found dead in the bottom of an empty fish tank. Maurice Scott, 30, who was still at the house when officers arrived, initially gave police a false name. He was arrested on charges of aggravated burglary, interference with a law enforcement officer, theft, animal cruelty and damage to property. Sweeney said Scott allegedly went to the front door of the house but discovered it was locked. He allegedly took off his shoes and opened a window so he could climb inside. A bedroom door was broken open, causing $50 in damage. The cereal, popcorn, fish and Brillo pad were valued at a total of $27. The fish? Man, that’s just mean! (Stole that from Lee Marvin in “Payback.”) Here’s the source.